When a chick falls from its nest, its long-term prospects are best if it can be put back in the spot where it hatched. If the nesting tree is marked, that means the Hui knows exactly where that chick hatched. Tern nesting data collected by the Hui is now helping “first responders” reunite fallen chicks with their parents. These ribbons alert tree trimmers and others that may be working in or near the nesting tree that there is a vulnerable egg or chick in the tree. Workers then know they need to be especially careful to not disturb the nest. Once the nesting event is over and the chick is able to fly, we remove the ribbon. Last, but not least, the ribbons provide information on what to do if a white tern chick is found on the ground. This information is making is possible for more people do what’s necessary to help the chick. As a result, since starting the program to place ribbons on tern nesting trees dozens of chicks have been saved. 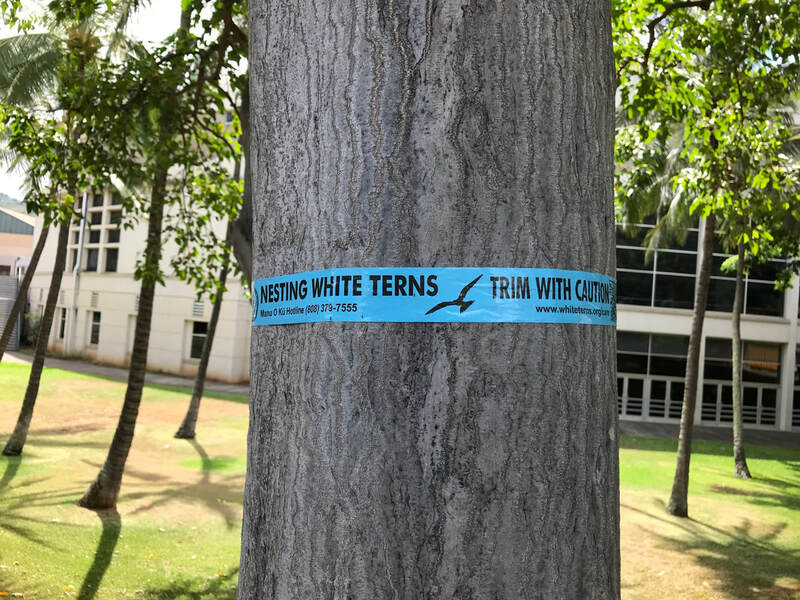 Whether you’re a pedestrian walking past, a volunteer monitoring Honolulu's White Terns, or a wildlife photographer looking for the perfect White Tern photo opportunity, these ribbons can help you easily identify nesting trees. Most importantly, ​if you see a tree with one of these blue ribbons, the chick in that tree has a much better chance of surviving to adulthood. If you find a tree with a White Tern egg or chick but no blue ribbon, please let us know where the tree is so we can improve the chick's chances of survival to adulthood. On the form below, please describe the location of the tree by using landmarks, an address, and anything that can help us locate the nesting tree. You may also email huimanuoku@gmail.com and include picture of the tree or a map indicating the location of the tree. ​Together, we can help conserve Honolulu's official bird!